1. The Superman Superhero theme. The Superman (my boyfriend), saves a girl (me :D ) *There's a picture attached of how the Superman saves a girl during night time, I would like the weather to be just like how it's shown in the picture, but the Superman would be saving me, carrying me in his arms, but both Superman and the girl face in the Caricature would be facing front, with wide smiles. 2. Background: Esplanade building at night and Timbre. 3. 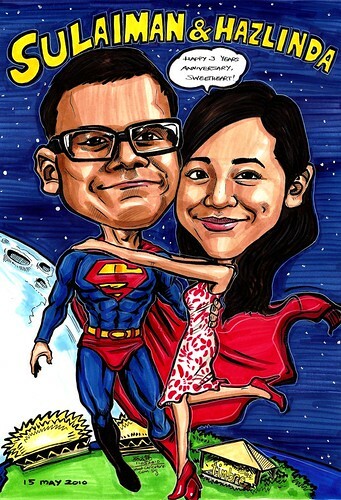 The boyfriend in the Superman outfit, the girl in a v-neck knee-length red floral dress, wearing a pointy red heels. 4. His look is to remain the same, do emphasize on his dimples. As for the girl, in the picture with the MacDonald fast-food t-shirt my hair seems long, I would like my hair in the caricature to be with the parting, not with the fringe up (the picture of me wearing pink top) and hair length to be slightly shorter. Possible, yes? 6. And a line that says, "Happy 3 years Anniversary Sweetheart!" and the date, 15 May 2010 is a must. " "Fantastic! I love it! Thank you so much!"